The allegations that the Russian government has been plotting to interfere with America’s elections has been baffling, as we’re far more used to hearing Putin, his propaganda machine, and almost every public official beneath him, accuse the Americans of meddling in our affairs. 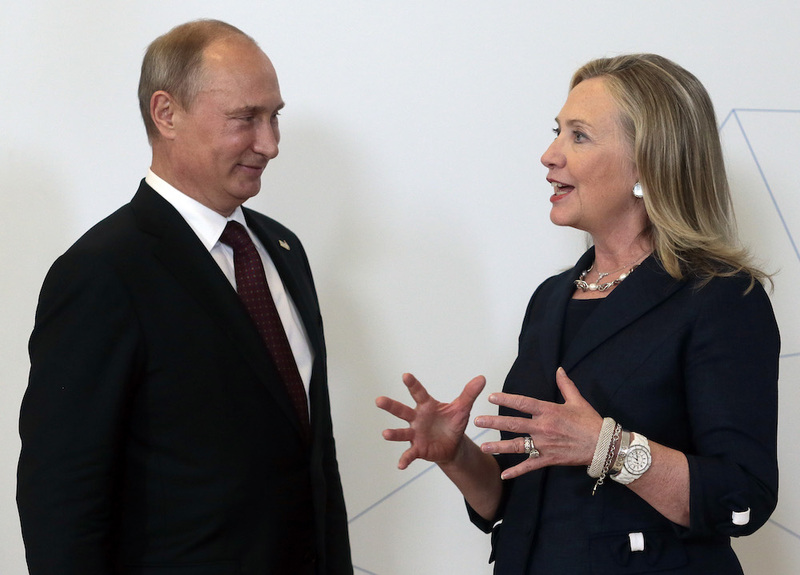 Putin himself accused Hillary Clinton, when she was Secretary of the State, of fomenting the massive protests against his re-election. And accusing the American government of being the culprit behind every Russia’s shortcoming—from anti-government demonstrations to fiscal woes to potholes—has become such a pervasive propaganda trope that there’s now countless online memes and jokes lampooning it. There’s even a fake Obama Twitter account that portrays, among other made-up hijinks, the American president ordering the State Department to raise the price for a Moscow metro ticket by 70 rubles (slightly more than $1) and to freeze the construction of a controversial soccer stadium mired in corruption and mismanagement. To see this same accusatory rhetoric turned on its head and used against Russia is as comical as it is stunning. On the other hand, frankly, we’re a little flattered. Russian State TV hosts relish every accusation hurled against our country with a mixture of indignation and pride: Hooray, we’re relevant again! Russians in general have a conflicted relationship with the West. Those old enough to remember the Soviet days resent whatever role they imagine the U.S. played in the downfall of the U.S.S.R., and the unseemly gloating the “winners” of the Cold War engaged in. But there’s more to it than that. As it’s been since the days of Peter the Great, we’re anxious to know how we measure up to the West. What do you think of us? Are you treating us fairly? Is Western media coverage of Russia outrageously biased? Call us sensitive. In my years as a journalist, I’ve attended countless press conferences held by visiting Western pop stars, and invariably the first question Russian journalists ask is what the outsider thinks of our country. This holds true even when it is painfully obvious that the two hours the star has spent between the airport VIP lounge, the limo in from the airport, and the hotel were not enough to form an educated opinion about the state of our nation. Media outlets, advertisers, and meme makers are also known to make up sensational fake quotes said by foreign celebrities about Russia (be they from dead statesman Otto von Bismarck or the current leader of China), and sometimes respected news agencies fall for the crude fabrications. The Interfax news agency, for instance, recently published a completely made-up quote by Donald Trump in which he supposedly called Olympic officials “morons” for barring the Russian Paralympic team from the Rio Games. The fake quotes not only are used to issue praise, but also to support anti-Russian conspiracy theories (one of the most popular nowadays is the co-called “Dulles Plan,” which alleges that the U.S. is injecting false values into Russian society, actively undermining the Russian sense of morality from within). In both extremes, the urge to fabricate panders to our collective sense of injured pride and grand ambition. … frankly, we’re a little flattered. Russian State TV hosts relish every accusation hurled against our country with a mixture of indignation and pride: Hooray, we’re relevant again! Russians’ attitude toward the outside world and its media is full of paradoxes. We Russians may come off as self-absorbed in our own informational vacuum and susceptible to our government’s propaganda. Yet foreign media have never been more popular in Russia. Articles from abroad that make even passing mention of Russia or Putin are translated by both mainstream media and specialized websites that attract many readers and commentators. No foreign article about Russia, no matter how insignificant the outlet or author, goes unnoticed. I know this, in part because I was involved in it. Between 2012 and 2014, I edited InoSMI.ru, a website dedicated to translating and disseminating foreign media to Russian audiences. The website had been founded a decade earlier by a patriotic journalist with the explicit goal of “showing what kind of blatant lies the biased Western media spreads about Russia.” Over the years, it built a small but fiercely loyal following. Today it’s the most popular—but certainly not the only—news translation website on the Russian Internet with over a million daily hits. If you look at InoSMI, you’ll see that its readers are hugely interested in the U.S. election. As I write this, the website’s home page features no less than a dozen translations from publications like The Washington Post, The Guardian, The Nation, and The National Interest. The attention given to the American presidential campaign is also reflected in the robust comments sections, which repeat the questions you already hear on the streets here. If Russia is the declining power in economic disarray so often portrayed in Western media, how can it have a decisive influence on what is alleged to be the world’s strongest democracy? Or, how is it Putin’s fault that American democracy is so flawed it can succumb to a populist charlatan like Trump? Russians also keep a careful eye out for moral relativism in America’s shortcomings. If the U.S. does it, whatever “it” is, than it should be okay for us to do as well (or, at least, should immunize us from American criticism for the same misdeeds). Hillary Clinton accusing Russia of fomenting party disunity instead of confronting an email leak that made her party look less than democratic? We’re familiar with that blame game. The Kremlin, too, likes to accuse protestors of being pawns of Washington in order to dismiss their grievances. Superpowers make great scapegoats. Plenty of Russians may roll their eyes at their own government’s portrayal of America and its intentions, but we’re also aghast at the simplistic and alarmist image your media and politicians have been projecting of us too. So you’d better be careful. We might just do something about it. Alexey Kovalev is the editor of the Moscow-based independent fact-checking website noodleremover.news. *Photo by Mikhail Metzel/Associated Press.